A new generation of cartridges is pushing the boundaries of rifle performance like never before. Ruger Compact Magnums fire the same weight bullet faster than any other cartridge of equivalent size. The new .30 T/C case is smaller than a .308 yet provides more velocity with the same weight bullet as the even larger .30-06. The .375 Ruger tops the larger .375 H&H Magnum. Hornady ammunition has collaborated with the rifle makers to develop these new cartridges, and this development goes back at least a decade, to when Hornady first offered their Light and Heavy Magnum Ammunition in such standard cartridges as .243, .30-06, and .300 Win. Mag. These cartridges achieved up to an extra 200 feet a second muzzle velocity yet stayed within the established safe pressure limits for the given rounds. When Hornady LeverEvolution ammunition came along, it also used this new technology to boost performance from old lever-actions like the .30-30 and .35 Remington, not only with streamlined soft-tip bullets but also with increased muzzle velocity. When a cartridge fires, gasses from the burning powder are trapped in the case until the pressure builds enough to move the bullet. As the bullet travels down the barrel, the propellant continues to burn and maintain pressure in the increasing volume behind the departing bullet. Hornady says the new cartridges use advanced loading techniques as well as new powders that produce pressure curves that stay at or near peak just a bit longer, and this sustained push better accelerates the bullet as it travels down the barrel. The Sporting Arms and Ammunition Manufacturers’ Institute sets safe peak pressure limits for factory ammunition. 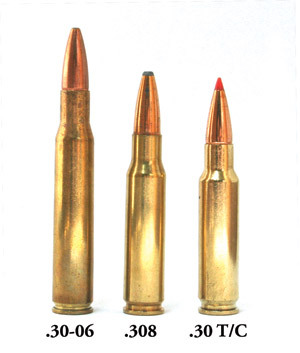 Since many older rifles were made with weaker actions, SAAMI dictates that cartridges that fit in these rifles, such as the .30-30, have low maximum pressures. More modern cartridges, such as the .270, .30-06 and .25-06, may be loaded to 50,000 to 55,000 pounds per square inch. And the newest rifle cartridges have pressure limits up to 65,000 psi. In the strongest rifles, the brass case itself becomes the limiting factor for safe pressure. When the short and super-short magnums came out, the makers claimed they got a potency boost from the enhanced powder-burning efficiency of the short, squat cases. But that was mostly just advertising. Their potency is due to the fact that they are loaded right at the pressure limits, rather than within the comfort margin of most factory ammo. 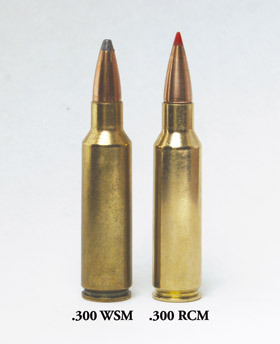 Technically, yes, the .300 Winchester Short Magnum is more efficient than a standard .300 Win. Mag., as it uses a bit less powder. But if it’s efficiency you want, shoot a .308. The short cartridges fit short actions, but otherwise haven’t any magic. Cor-Bon also has a reputation for producing potent ammunition, and as I understand it, they also do this by keeping close tabs on their loading process and holding tight to SAAMI maximum pressures. It seems that most ammo company lawyers demand an additional margin of safety, to limit the company’s legal liability should an accident occur. I still see shooters shake cartridge cases and then comment that they must be potent because the case seems to be full. Nope, it doesn’t work that way. When designing a cartridge, or reloading one, it’s customary to use a powder that pretty much fills the case. But it doesn’t have to be this way. Different powders with varying burn rates can achieve top pressure in a given cartridge and bullet weight, each one filling the case to a different fullness. A slower burning powder keeps pushing the bullet longer, and, all else being equal, this should boost velocity. But you can’t just go with the slowest powder, either, because case capacity also becomes a limiting factor. There isn’t enough space in the tiny .22 Hornet case to hold enough of a slower-burning powder to boost velocity. The .223 case has much more capacity, which is why it can use slower powders to drive the same bullet faster. And the even bigger .22-250 works even better. When developing a handload, slightly faster powders may be tried (or calculated) until the “right” powder is found, one which just about fills the case and achieves maximum pressure and velocity. Reloading manuals list several powders of similar but not exactly the same burning rate for each combination of cartridge and bullet weight. It’s usually a matter of determining which combination creates the best vibrations for accuracy from that particular gun barrel. If you look in the manuals, you’ll also likely note that maximum loads for heavier bullets always use less powder. This is because heavier bullets offer more resistance, and a bit less powder actually builds the same maximum pressure. And even when the bullet weight doesn’t change, hand loaders need to be so very careful about adding even the slightest little bit of extra powder. According to the Lyman Reloading Handbook, the .38 Special, with a 158-grain jacketed bullet uses 5.0 grains of Hercules Unique for a maximum load, and just another .2 of a grain raises that pressure to +P levels. The .38 Special +P load is recommended only for “better condition” guns, and use of this ammo may accelerate frame wear. The .357 Magnum cartridge was built 1/10-inch longer than the .38 Special cartridge, not so much for the increased case capacity but mostly to keep higher-pressure .357 cartridges from fitting into older and considerably weaker .38 revolvers. Yes, the added case length allows for a bit more powder, but the tremendous pressure increase is what elevates the .357 to another level of performance. The .357 cartridge generates two and a half times the pressure of the .38. The .45 Long Colt, one of the cartridges that won the West, is relegated to factory ammo pressures of under 15,000 psi because of all of the old revolvers still out there. There is no .45 magnum, but we have the .454 Casull, and this newer cartridge goes well beyond what might be considered .45 magnum. It launches a 250-grain bullet at almost 1,800 ft/s with 1,800 foot pounds of muzzle energy. It’s a real handful to shoot, and it has taken elephants. The Casull is loaded to almost 55,000 psi, a level of pressure more associated with the locking lugs of a bolt-action rifle than the cylinder walls of a revolver. And, yes, the .454 Casull case was also built 1/10-inch longer so it couldn’t be accidentally loaded in the older, weaker .45 revolvers. The .257 Roberts was a popular wildcat cartridge before it was first offered in a factory rifle, back in 1934. As I understand it, factory “Bob” ammo was loaded to very modest pressures to minimize recoil. It was a pleasure to shoot, and even with its round-nosed bullets, effective in the deer woods. It gained a following. But when the .243 was introduced in 1955, with full potency and streamlined bullets for better velocity and a much flatter trajectory, the shortcomings of the .257 were revealed. The .243 blossomed, and the Roberts sank into obscurity. The old Bob got a recent nod with new Winchester .257+P factory ammunition. This ammo operates at considerably higher (but not quite top) modern pressures to launch nicely pointed bullets at velocities more comparable to the .243. In fact, anyone who feels the .243 doesn’t deliver quite enough bullet for big game might be very satisfied with a .257+P, or an equivalent .257 handload. Manufacturers measure pressure by firing cartridges in a special barrel with a chip of copper that is crushed by the pressure. The crushed piece is measured, and the pressure calculated. The numbers are very precise but not exactly equal to psi, which is why we sometimes see cartridge pressures expressed in copper units of pressure, or c.u.p. Handloaders can measure pressure with a strain gauge, a small metallic grid super-glued to the barrel over the chamber. When the rifle fires, the steel around the chamber stretches ever so slightly and then springs back. This stretch is electrically measured and the pressure computed. I use the Oehler Model 43 Ballistics Laboratory strain gauge and find it indispensable when developing new loads. Some newer reloading powders, such as Hodgdon’s Hybrid 100, show promise at providing increased velocity within safe pressure limits. But I don’t think they match the powder being used in the new Hornady cartridges. Steve Johnson, marketing manager at Hornady, said that careful handloaders may get within 100 ft/s of the velocities Hornady is achieving with these new cartridges. Few shooters appreciate the exacting work required to develop a cartridge and powder combination with the just-right burn rate to safely push a bullet out of a gun barrel with top velocity and accuracy.